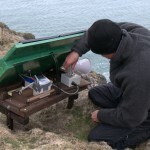 This month saw the start of an innovative project in local waters aimed at trying to lure puffins back to Ramsey one of the Pembrokeshire islands and an RSPB reserve. Puffins used to breed on Ramsey in the 1800’s but with the arrival of rats through shipwrecks their days as a breeding species on the island were numbered. Rats are, as we have seen on other islands (see here and here for other local examples), voracious predators and when they find their way onto seabird islands their impact is devastating. Millions of years of evolution have seen some species of seabird adapt to breed in burrows underground. This allows them to avoid avian predators such as gulls but when you suddenly introduce an alien mammalian predator to which they have no defence the impact is catastrophic. 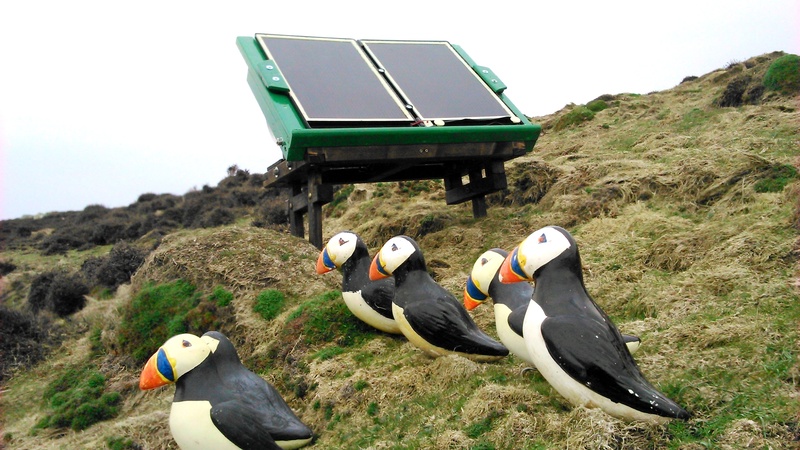 Four years ago, decoy puffins were put out on Ramsey’s cliff tops in the hope that they might attract puffins regularly seen at sea around the Island (there is colony nearby at Skomer Island) but with no success. 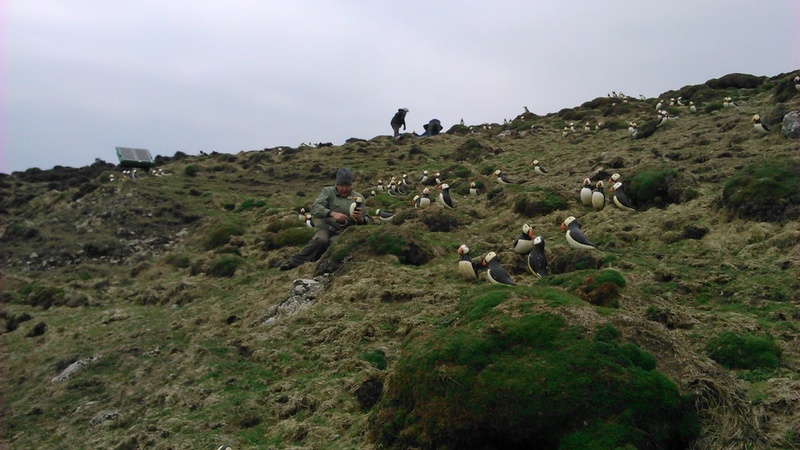 However, seeing the responses of puffins at Copeland Island where sound was added a couple of years ago it was decided to try this approach on Ramsey. 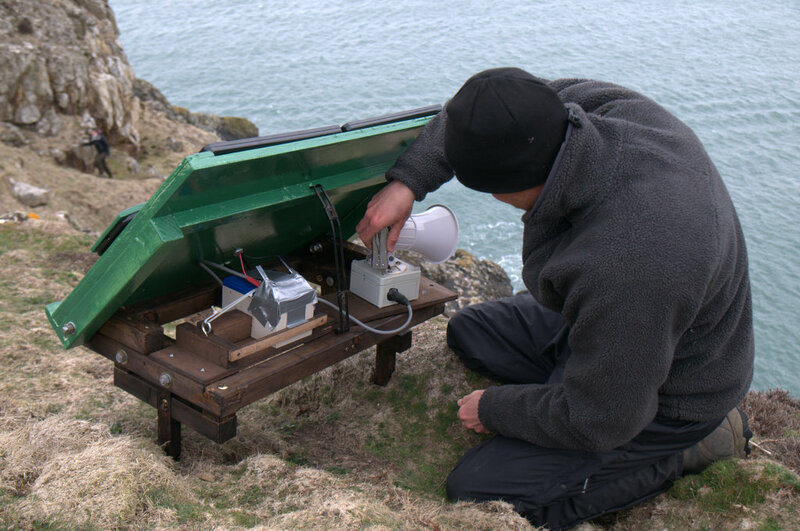 Nigel Butcher, ace technician in the Conservation Science Department at the RSPB made the sound system which plays the call of a puffin on a repeat loop from a loudspeaker (very loudly!). German technology then completed the outfit when Michael Hoffman, one of Ramsey Island’s regular and very talented volunteers made a sturdy frame on which to securely site the device plus a solar panel to keep the battery topped up. The decoys accompanying the sound system were made by Ed Tycer. It is hoped these will act as an added attraction if birds make landfall. The system was trialled last year for a short, four-week period, with some success whilst dealing with early teething problems. Birds were recorded making landfall on low tide rocks below the speaker and on one memorable occasion eight birds landed on the cliff tops among the decoys. With the device out for a full season this year it is hoped the project can build on this success and see puffins return to their rightful place on the Ramsey Island breeding bird list. Could a project like this work in the Channel Islands? Well, yes, in theory it would be well worth trying. However, where is there suitable puffin-friendly ground that has no rats? That is pretty scarce and the best current puffin site, Burhou, probably already has space for more puffins anyway. But, with tiny colonies away from Burhou only barely surviving, could birds be lured to safer spots? That might well be worth trying – but first, get rid of those pesky rats!